I had the opportunity to be interviewed by Foundry Art Centre Administrative Coordinator Jillian Schoettle. We talked about my current and past work, choice of mediums that support the work, my background and approach to teaching. Read it all here: http://www.foundryartcentre.org/blog/fac-artist-spotlight-lisa-sisley-blinn. Her fluidity between series and projects allows for her to approach pieces again as new concepts emerge. Article & Photographs by Jillian Schoettle. Thank you Jillian! Like many, I use the Internet for information gathering, sourcing, and inspiration. I read news articles, find new art blogs, follow leads, and look at a lot of images. Here is a short list of what crossed my monitor this week. Today my searches for information have centered around how to find support to sustain being an artist. This may take the form of grants and residencies, or advice on how to work with a gallery. Below are some of the most interesting sources I found this past week. Even Google can help you if you have the time and endurance! CAA Opportunities (College Art Association). Nice long list. Art Contests, Competitions & Shows Where You Pay Up Front. Time waster, scam, or true opportunity. You only know for sure after you do your homework. Don’t take it for granted that the exciting offer you received is real until you sort out all the details. Good article from ArtBusiness.com. What are your strategies for finding the best venues, competitions, and related artist opportunities? Post your ideas in a comment! Yes, I am a tool junkie. Can’t help it. Good tools just make life easier, unique and unusual tools make it exciting. Tools that you have been lusting over for a year are precious. 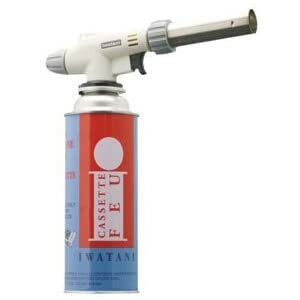 New to my studio is the Iwatani Torch Burner Professional, $34.00 plus shipping at the time of my purchase. I know, this is not new to many of you, nor is it huge, but it is a step up for me from my 10-year-old 5″ tall crème brûlée torch. I will gradually make my way to the “Rambo” sized propane canister with wearable holster and torch on a flexible hose, but for now, baby steps. The pistol ignition is as easy as advertised. The flame size adjustment and air regulating system is also as easy as described. Just gently turn the gray knob on the back to start the fuel flow (you will hear it fizz a bit), and squeeze the trigger. Instant flame! The gray ring around the front metal barrel adjusts the flame from a very small and soft glow to a billowing flame. Between the fuel flow and the flame control you can adjust the amount of heat and surface area affected by the flame quickly. To turn the flame off, rotate the gray knob on the back until the fuel is no longer flowing, and the flame dies out. 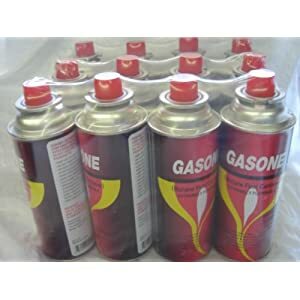 Cartridge has a Notched Collar providing easier alignment in portable gas burners! For those that are not ready for a big torch, and want to get started with something bigger than the tiny standard kitchen torch, this is a nice size. It fits in your hand and is not too heavy. It is good in the studio on medium-sized work, and great in a class room. It is easy to transport, and is not too scary for beginning encaustic students. The main negative is that you do have to keep buying the fuel canisters. What torches and fuel are you using? Leave a comment. Materials & Lab Fee: No fee, basic material pack included. Encaustic is a paint medium composed of beeswax infused with damar resin and ground pigments. Layers are fused with heat and can range from transparent to opaque, wispy thin to thick and dimensional. Encaustic is luminous, forgiving and versatile. Currently there is a resurgence of interest in this medium that is over 2000 years old. New encaustic paints, materials and tools, books and blogs, and dedicated researchers and instructors have generated a wealth of support and information. Safe studio methods for working, as well as shipping are well documented. And, there is a growing community of artists that create intriguing works and share their knowledge. “Introduction to Encaustics” is a beginner level workshop, which will focus on current methods, materials and artists. After a brief history, we will explore studio safety, tools and materials, supports, heat sources, encaustic paints and medium, mark making, transfers, direct and indirect drawing, collage and embedding techniques. Go to “Workshop: Introduction to Encaustic”, https://sisleyblinn.wordpress.com/workshop-introduction-to-encaustic/, for additional class information regarding the materials list and class information. Lisa Sisley-Blinn earned a BA in Art Education and Biology from Carroll College, and an MFA from Western Michigan University. Sisley-Blinn has been working with the encaustic medium for over 9 years, has attended numerous encaustic workshops, as well as International Encaustic Artists conference. Sisley-Blinn has paintings, prints and drawings in both private and corporate collections. I often wonder where other artists working with encaustics get their supplies. Some materials and tools are easy to find, some hard, and some ingeniously come from unusual sources such as the kitchen, garage, or thrift stores. Looking over my acquisitions for 2009 revealed this list of frequently used sources.